For more than 40 years, Willie Nelson has been a national treasure, contributing many memorable songs to our musical canon. His impact, however, extends far beyond the scope of his music. A champion of family farms, Nelson has helped mobilize support for the American farmer, both as a founder of Farm Aid and more recently as one of the nation's most knowledgeable and recognized advocates of the use of biodiesel—a clean-burning, renewable fuel made from vegetable oils or animal fats. 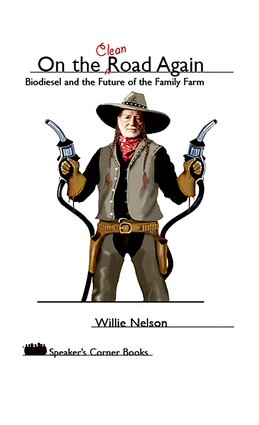 In this funny and inspirational book, Nelson confronts our dependency on foreign oil as a source of energy. Through facts, stories, and interviews with everyday Americans, he explains the benefits of biodiesel as an alternative fuel that not only drastically reduces carbon dioxide emissions, but also may help save our family farms. Willie Nelson, originally from the tiny farming community of Abbott, Texas, boasts a legendary career as a singer, songwriter, and actor. This American icon has also established himself as an advocate for the family farmer with his annual Farm Aid concerts and his recent venture in biodiesel.